← Apple: Honey I Forgot the Customer! Continued from Apple: Honey I Forgot the Customer! Solutions are driven by user needs. Even innovative new offerings need to be based on the needs and habits of real users. Apple’s iPone 4 debacle, aka “Antennagate”, came about in part because they failed to include actual users in their development cycle. I have great admiration for Steve Jobs, Apple and their innovative products. Apple continues to impress. And I’ve had the iPhone on my shopping list for a while. Maybe that’s why this episode is so frustrating. By all appearances, Apple failed to sufficiently test this great product in the field. Had they tested it, they would have seen that consumers were holding it the wrong way and degrading reception, and they could have prevented the whole issue. I think Apple owes us more than they delivered out of the box. Jobs’ press conference is a start but most of all, I hope that they’ll do a better job of field testing in the future. In general, customers – and especially businesses – buy stuff that solves their problems and meets their needs, and they avoid those that don’t. But all too often, engineers and visionaries design products based on what they think that customers should want. Or how customers should use the product. But you can’t tell a customer what they want and you can’t tell them how they must use your product. And you certainly can’t force them to buy. To assume otherwise is, well, arrogant. Solutions, on the other hand, solve defined problems that customers really want to solve. Solutions are not about should want/should buy. Rather, solutions focus on real problems and real answers that lead to real sales. Solution marketing is all about humility to the customer and their business problem. Vision + Solutions = ? So what happens when a company tries to combine vision (should want) with solutions (do want)? You end up with creative offerings that solve a problem in a new, but often incomplete, way. And that incompleteness usually comes as a total surprise to the company. There’s a reason why most tech companies run beta tests on products: even the most brilliant engineers can’t predict what will really happen once the technology is in the hands of users out there in the real world. And that is how Apple ran into the iPhone Antennagate debacle. To be clear: vision and innovation are critical, driving competitive advantage and revenue growth. But most customers only care about vision and innovation to the extent that they really do help them to solve real problems – without hitches such as dropped calls or “do-not-touch” zones on the expensive iPhone. Even (and especially) the most revered companies can become prone to arrogance. But most software companies aren’t like Apple and they lack its cult-like following. And that will make your company’s arrogance easy to spot. Prospects don’t understand your product. The fix: Think about the world from their perspective and describe how you can fix their problems – in their words. Prospects won’t pay for your offering. The fix: Price your solution based on value, not just cost. Consider the benefit the customer will achieve, and show how your solution will deliver value. You spend all of your time at your desk. The Fix: Spend time in the field talking to customers and prospects, and incorporate their feedback into your solution, message and sales enablement. You build insanely great products. The Fix: Consider – who thinks it’s “insanely great”? Users? Customers? Does it solve a complete problem? When you create and market solutions that solve real business problems, you’ll gain a loyal following. 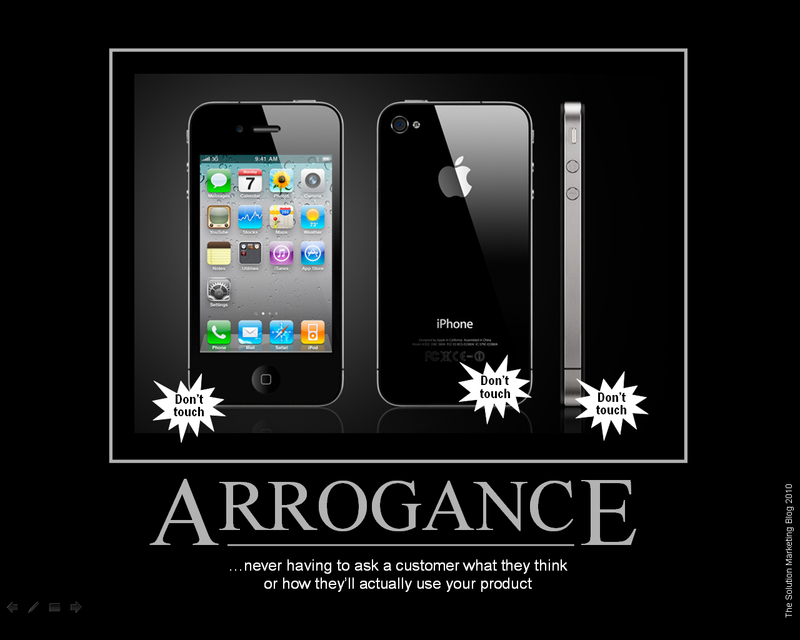 It’s simple: for most of us, arrogance leads to failure. Spot the warning signs of arrogance and change your behavior. Offer real solutions to real problems and your own company will build a cult following that rivals that of Apple. Apple: Honey I Forgot the Customer!